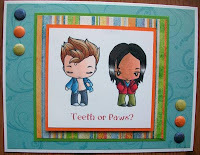 This is for today's TGF Farm Fresh Friday challenge - case a card by Rachel (aka AirForceMommy). Here is the Rachel's card I chose to CASE. 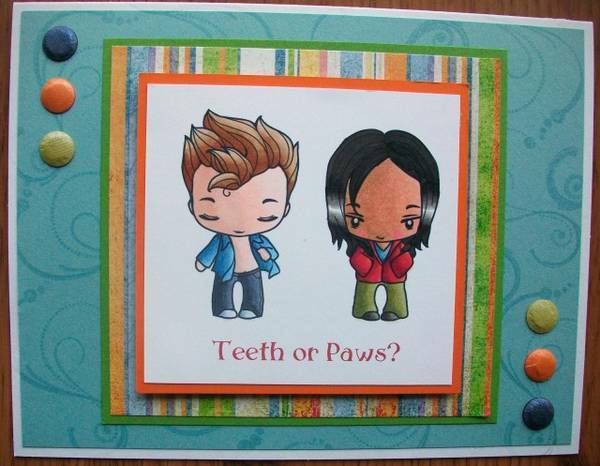 After all, I can't resist a Twilight-inspired card! I just love her yummy coloring and fantastic highlights in the hair. Yea, I know I am pushing my luck getting this week done, but inspiration was in short supply. I feel like I am a bit redundant in techniques right now, so I was not feeling particularly inclined to hustle. This week's theme is "Torn Between" and we are to create a spread using a tearing technique. This is for Anyone for Anya's sketch and TGF's FFF Halloween challenges. So my mojo has been a bit lacking and now I am playing catch up... This is for Anyone for Anya's Masculine and Pixie Dust Studio's Round & Round challenges. This is for TGF's Farm Fresh Friday White Out and Deconstructed Sketch #19 challenges. This is for TGF's WOW sketch and Stamptacular Sunday's Just Sayin' challenges. This week's assignment is "Cut & Paste." We were asked to center our spread around a head we cut and pasted into the design. I couldn't just randomly pick a picture and use it, so I started looking around for ideas and kept coming across pics of Barbie...yuck! I can't stand her. Sure, I played with them, but she is the most unrealistic creature and the complete opposite of everything I am. I don't love pink and she is coated in it like Pepto, she's blonde, skinny, etc...yea, not me. I can't believe my oldest is in Sixth Grade! It seems like yesterday she was just learning to walk. Anyway, her fall pics are already back because they needed them for their school IDs. This week's journal entry is "The power of ONE." We are to create a spread using a word as the focal point of the design. So, I started looking for ideas and came across this delicious vinyl sticker from My Mind's Eye in my rub-ons stash. Hmmm, what can I do with this? I started looking for quotes...yes, I could have used another Twilight thing, but I wanted it to reflect one of my other loves - Disney! This is for TGF's Farm Fresh Friday's Hot or Cold challenge. This is for TGF's Mystery Monday CASE and Deconstructed Sketch #18 challenges. I chose this design because of the bright colors in Amy's card - lots of pink, turquoise, lime, mauve, razzleberry, orange and white. This is for Stamp Something's Anything Goes and TGF's WOW Metal Head challenges. This week's assignment is "Every Cloud has a Silver Lining." So, make a spread inspired by clouds. Yea, I could have used the title, but the first thing I thought of was a line from Paramore's Brick by Boring Brick... "keep your feet on the ground when your head's in the clouds." This is for Anyone for Anya's Back to School and TGF's Farm Fresh Friday's By the Numbers challenges. This is for Paper Sundae's sketch challenge. This is for Deconstructed Sketch #17, Stamptacular Sunday's The Sky's the Limit, Stamp Something's September digi, and Pixie Dust Studio's Back to School challenges. This week's Heart Journal assignment is "Text Me!" We were told to create a spread using primarily text.